Marinate fish pieces with 1 tbsp kashmiri chilli powder, 1/4 tsp turmeric powder, salt and 1 tsp lemon juice for 30 minutes. In a large pan, boil water adding enough salt. Add rice and cook till done. Drain the water and keep it aside. Heat oil in a pan and fry the marinated fish pieces on both sides. Make them into small pieces and keep it aside. In the same pan used for frying fish, add chopped onions and saute till transparent. Add chopped garlic, ginger and banana pepper/thondan mulaku and saute well. Add 1/2 tsp turmeric powder, 1/2 tsp kashmiri chilli powder, 1/4 tsp pepper powder, 1 tsp coriander powder, 1 tsp garam masala and saute well. Then add chopped mint leaves and coriander leaves and mix well. Add fried fish pieces and mix well. Add cooked rice little by little and mix well. Adjust salt and add 1 tbsp lemon juice, few chopped coriander leaves and mix well for 2-3 minutes. Remove from flame and serve hot..
Nice flavorful rice for fish savvys like me..Yummy bowl and thanks for this recipe.. 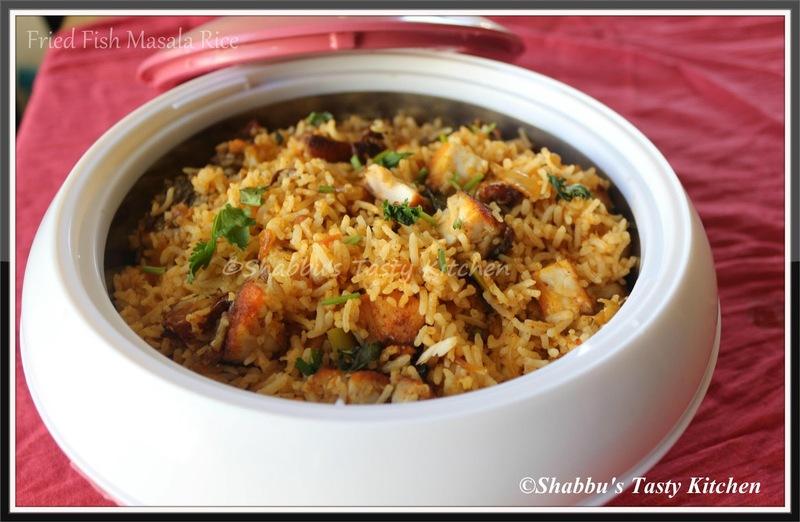 Very delicious and lovely rice, I have not tried this, yummy will surely try it. This sounds wonderful, looks fantastic! Wow very nice and tempting rice. Oh Gosh! What a fabulous rice dish. 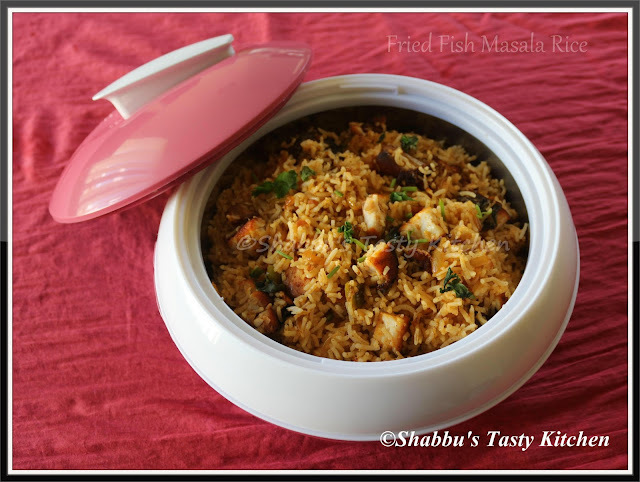 Fish in masala rice.......yummy and mouthwatering.